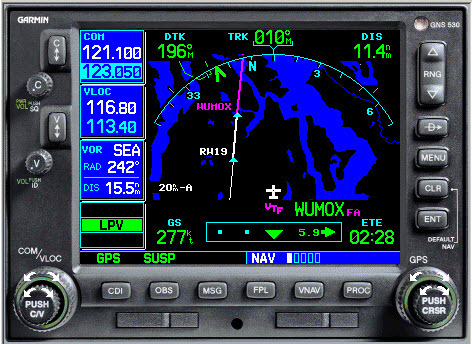 One key to staying ahead of both ATC and the computer in the cockpit during the high-workload phases of an approach is avoiding the temptation of the Vectors-to-Final option available on IFR-approved GPS navigators like the Garmin GSN530W/GNS430W and integrated avionics such as the Garmin G1000. For information about a change to the VTF feature in new system software for Garmin GTN units, see Changes to Vectors-to-Final in Garmin GTN System 6.x. A better choice, regardless of the type of approach, is to load the procedure and choose an IAF or other fix based on your position relative to the airport, and then, when appropriate, activate a leg of the procedure or fly direct to a fix, as cleared by ATC. Selecting an IAF or IF keeps all the fixes on your map and makes it easy to accept and fly a specific clearance. Selection of “Vectors-to-Final” or “Vectors” option for an instrument approach may prevent approach fixes located outside of the FAF from being loaded into an RNAV system. Therefore, the selection of these options is discouraged due to increased workload for pilots to reprogram the navigation system. Note that at no point during the approach is it necessary (or often even advisable) to active the approach. To see how this method works, let’s explore a common scenario. Assume the weather favors landing on runway 19 at KPWT. You have two options for the approach, the ILS RWY 19 (PDF) or the RNAV (GPS) RWY 19 (PDF). The latter offers LPV minimums that can get you almost as low as the ILS, and we have a GNS530W on board, so let’s get our money’s worth out of the IFR GPS box by flying the RNAV approach. No published transitions begin south of Bremerton, so as you approach Olympia (OLM), Seattle Approach begins issuing vectors to the approach you’ve requested. Because you don’t know where you fit in the traffic picture, you can’t be sure where ATC plans to have you join a published leg of the procedure. Approach could take you north to join outside of GITRE, an IF. More often, you’ll get vectors to a modified downwind, followed by a base leg that joins the final a few miles northeast of WOMAX, the FAF. If you’re following traffic, you might fly north far enough to get a heading or a clearance to fly direct to one of those fixes. You are flying vectors, so confirm that your autopilot is in HDG mode (or hand-fly the airplane). 1. On the GNS530W, press the PROC button. 2. When Select Approach appears, press ENT. 3. Scroll to RNAV 19 and press ENT. 4. The Trans menu appears; select LOFAL (an IAF) and press ENT. 5. The GNS530W shows the procedure on the map and asks you to LOAD or ACTIVATE the approach. Choose LOAD and press ENT. Nothing happens at this point, which is good. You’re still flying vectors assigned by ATC. The autopilot is tracking the HDG bug, and the approach is appended to your active flight plan. Continue flying the heading(s) and altitudes that ATC assigns. Don’t fret about the fact that you’re not going to LOFAL. You can use this lull in the action to brief the approach, verify that the picture on the moving map matches the plan view of the plate, and complete your approach checklist. As you fly north, ATC may vector you to GITRE (an IF), or, more likely to join the approach a few miles outside of WUMOX, the FAF. To anticipate the latter scenario, use the Flight Plan page and activate a leg of the procedure. 1. On the GNS530W, press the FP button. 2. The Flight Plan pageappears. The approach you loaded is at the bottom of the current flight plan. Scroll to WUMOX. 4. The Page Menu appears; Activate Leg is highlighted. Press ENT. 5. The line between GITRE and WUMOX turns from white to magenta. Again, nothing happens. The autopilot is still in HDG mode (or you’re hand-flying the ATC vectors). But you’ve told the GNS530W that you’re now flying an approach, and on the map, you can see your position relative to the full procedure, not just the FAF. Continue flying assigned vectors as ATC turns you west and then southwest toward the “gate” a few miles outside the FAF. 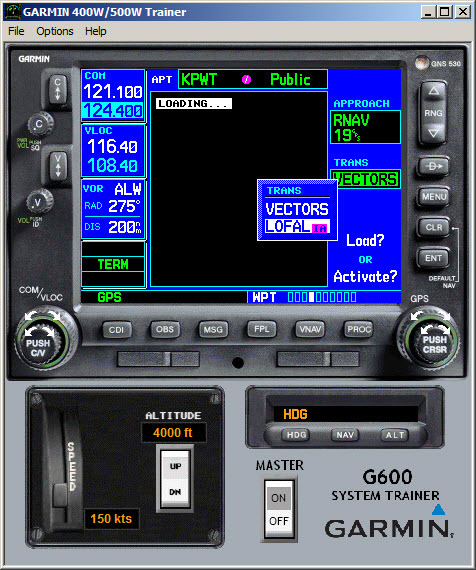 Notice that the SUSP annunciation has appeared above the OBS button on the GNS530W. Resist the urge to make it go away. Don’t push the OBS button! Carry on and all will be well. When you are established on an intercept to the FAF or on a leg between an IF and the FAF, the GNS530W will automatically cancel SUSP mode. This behavior is a feature of WAAS-approved IFR navigators. It’s part of TSO-C146a, the specification that governs the hardware and software for WAAS navigators, and its various appendices and addenda. To learn more about this feature, see p. 5 in What is New with the 400W – 500W Series, a PDF document available at the Garmin website. Set the heading bug to 250, and fly toward the magenta line at 2,500. If you have a typical autopilot, you can then arm the NAV or APCH mode on the autopilot, and it will intercept the magenta line outside the FAF. As the airplane tracks inbound toward the FAF, confirm that LPV miminums are available. 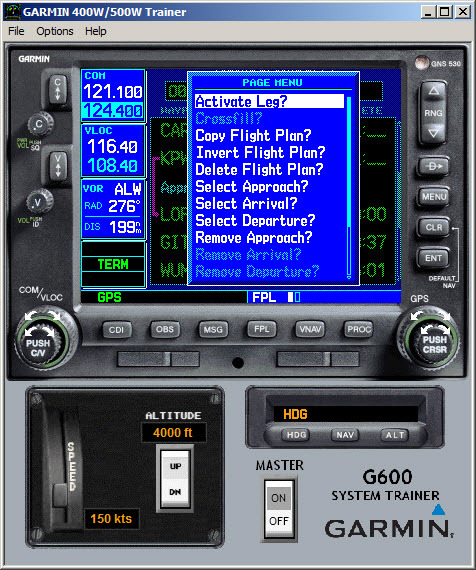 Note that as you pass the FAF, the GNS530W automatically sequences to the MAP. In other words, the approach has become active, but you never “activated” the approach. Manually activating an approach isn’t necessary; the procedure became the active flight plan when you activated the leg between GITRE and WUMOX. Suppose that for some reason—perhaps your spacing behind traffic isn’t working out—ATC throws you a curve after you’ve activated the leg between GITRE and WUMOX, and approach sends you farther north toward GITRE—or even LOFAL. No problem. Because you never activated Vectors-to-Final, there’s no need to cancel the current approach and go through the rigmarole of re-loading a procedure. Just return to the Flight Plan page and select another leg to activate, or choose direct-to any IF or IAF that’s part of the approach. 2. The Flight Plan pageappears. Scroll through the waypoints on the current approach at the bottom of the current flight plan and highlight the fix to which you’ve been cleared—or choose a fix that defines the end of the leg you now expect to join. 3. To proceed direct to a fix (say, GITRE), highlight the fix and press the Direct-To button. 4. When prompted to activate that waypoint, press ENT. In this example, GITRE becomes the active waypoint, and you can fly directly to it. 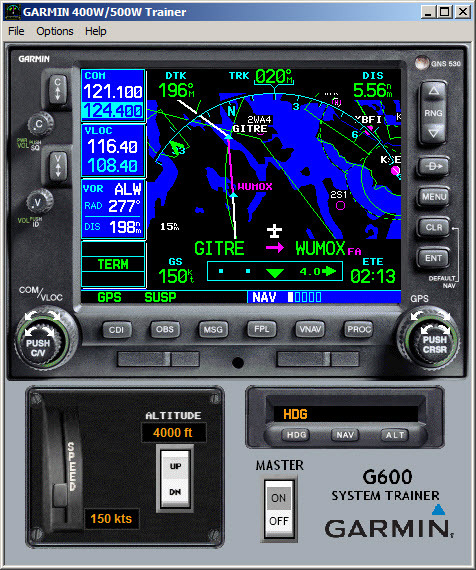 The GNS530W will sequence to the next waypoint on the approach and guide you (or the autopilot) all the way to MAP. Again, there’s no need to manually activate the approach. To learn more about the features described here, see the handbook for your GPS navigator. Garmin posts free PDF versions of its manuals on its website. Here are the links for the GNS430W and GNS530W. You can practice the procedures described here in the free PC-based trainers that are also available for download at the Garmin website. 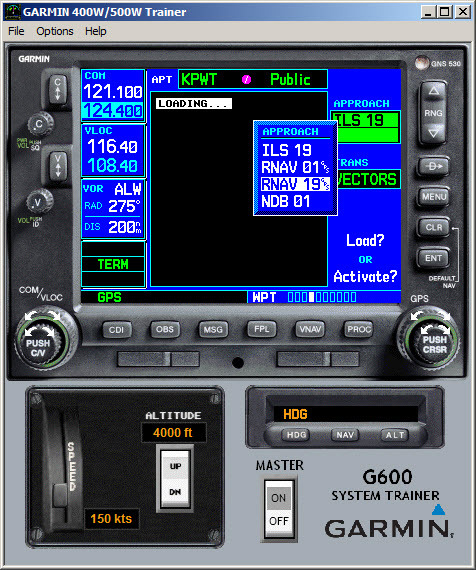 Even if you don’t have a G500/G600 display in your airplane, it’s often best to use the PC-based trainer for that system, because you can see the aircraft’s flight and navigation instruments (the screen captures in this article were taken from that simulation). 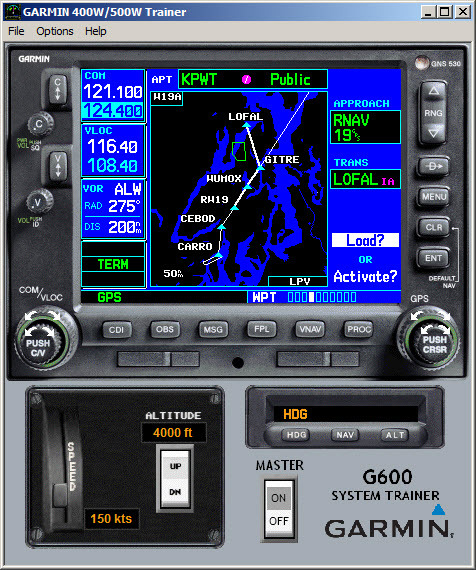 The free G500/G600 PC-based trainer, which includes a GNS530W and GNS430W simulation, is available for download here. You can also find excellent advice–including more details about this way of flying RNAV (GPS) approaches–from Max Trescott, the national CFI of the year in 2008 and author of several books about using GPS and advanced avionics systems. 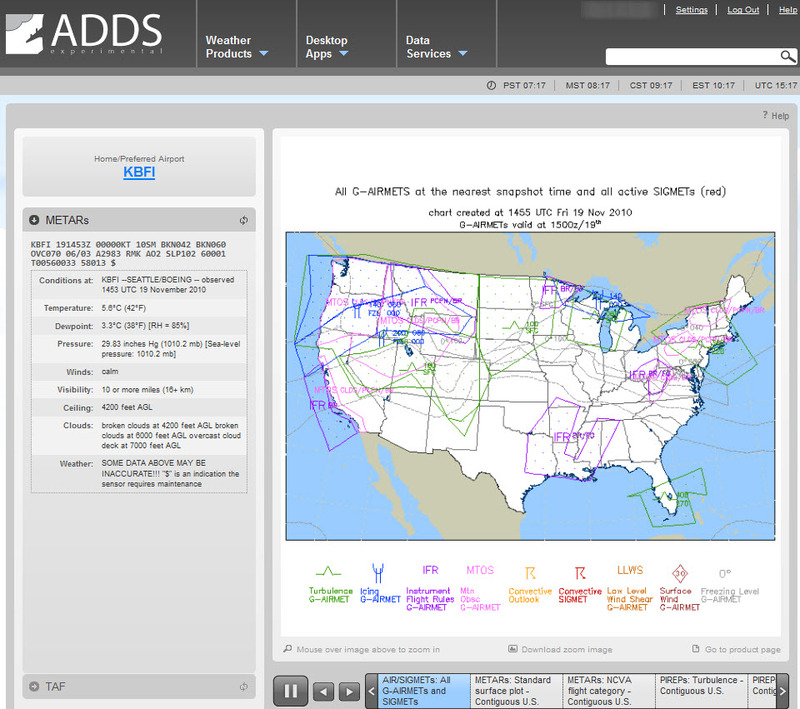 The National Weather Service has overhauled part of its Aviation Testbed, the Experimental Aviation Digital Data Service (ADDS). It’s a sandbox for the good folks at the Aviation Weather Center, who host the official ADDS, where they experiment with new ways of presenting information and test innovative reports and forecasts aimed at pilots, dispatchers, and others involved in flying from A to B. The new site shows offs several innovations, including an intuitive interface and slick details, such as clean, easy-to-understand format for METARs and TAFs. That display simultaneously shows both the coded text and a compact, but clear, breakdown of all the elements in plain language. I’d like to see this presentation become standard not just on the Web, but on displays in the cockpit as well. The new site also offers easy access to the latest versions of the Desktop Apps (the Flight Path Tool and HEMS Tool), which are handy ways to consolidate weather information to see how it might affect a specific route. Provides weather of interest to low altitude pilots in an interactive display. Interpolates 3D weather variables to AGL altitudes. Includes street-scale basemaps. To get the greatest benefit and ease of use from the new Experimental ADDS site, register by creating a user name and password. When you log in with those credentials, you can customize the site by choosing a preferred home base and offer comments and suggestions in the new online forum. For more information about the new site, see the Getting Started Guide (PDF). Here’s a link to a video from AOPA Live about crosswind landings. 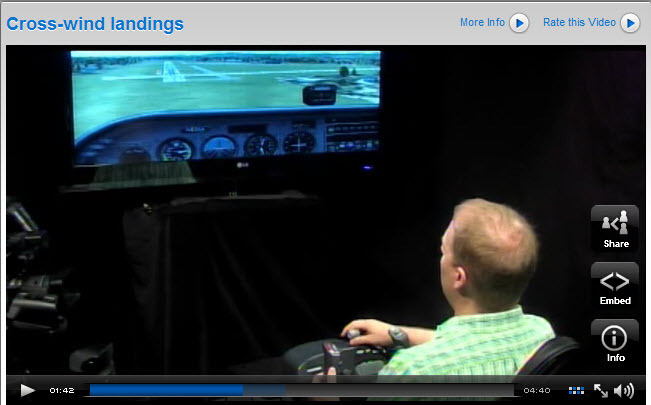 Ian Twombly of AOPA Flight Training magazine uses Microsoft Flight Simulator to demonstrate and discuss the crab and slip methods of correcting for a crosswind. 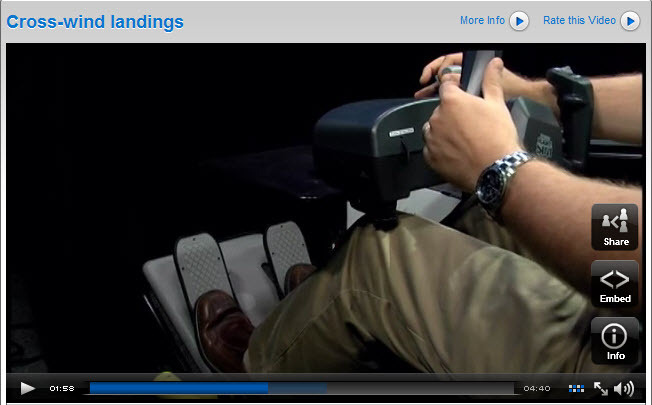 Whatever quibbles you may have with the video, and regardless of the method you prefer (I suspect most instructors advocate crabbing to some point on final; that point varies with airplane, pilot experience, and conditions), this brief video shows how you can use a PC-based flight simulation to explain and demonstrate a specific concept or skill. Having the pilot in training “fly” the simulation isn’t always necessary (or even desirable). Think of the simulation as an interactive white board. It can be used one-on-one, in front of a small group, or as part of a presentation to a crowd. And, of course, as a video streamed over the Web. The video also dem onstrates how instructors and flight schools can use today’s technology offer high-quality, focused, and useful content to the flying community at very low cost. As I emphasize in presentations and my book about using PC-based simulations as a training aid, the key to utilizing tools like Flight Simulator and online video is to focus on specific topics and skills. Allow both student and instructor to focus on specific tasks—real-world distractions (conflicting traffic, ATC communications, etc.) don’t interfere with learning the task at hand. Kudos to Twombly and AOPA for showing that Flight Simulator is much more than just a game that helps pilots manqué live their flying fantasies. Sporty’s has released an updated version of VFR Communications, one of several titles in its “What You Should Know Series.” The one-hour program is aimed primarily at new pilots, but given what we hear every day on the radio, many flyers could benefit from a review of its contents. Like other new DVDs from Sporty’s, VFR Communications benefits from a much-improved menu structure that makes it easy to jump to specific sections, and overall, the quality of the video, graphics, and related features is a big leap from the first releases in the series. Interactive programs like this one can be a boon to both instructors and students, especially beginners who are anxious about talking on the radio and those who don’t speak English as their first language. The program mostly sticks to standard practices as outlined in the AIM, and it generally offers sensible advice about real-world communications. In fact, the DVD includes a couple of sections that discuss non-standard phraseology that is often heard on the air, a nice touch that could help newcomers understand what’s going on when pilots use idioms instead of the Hochdeutsch pilots and controllers should speak (except, perhaps, in Chicago’s airspace). The DVD includes sections on the A-B-Cs of communications and detailed discussions of typical situations, such as VFR communications while en-route; operating in Class B, Class C, and Class D airspace; and on and around non-towered airports. To its credit, the program also notes that when a situation isn’t covered by the standard phrasebook, speaking in plain language is not just acceptable, but to be encouraged. I do have a few quibbles with some of the advice. For example, the topic on communication with Flight Service emphasizes including the frequency you’re using to help the specialist select the appropriate remote communications outlet. But as AIM 4-2-14 Communications for VFR Flights notes, on your initial call, you should also give your approximate position, preferably referenced to a nearby VOR or airport. The trivia police will note a few other venial sins of omission and commission, such as suggesting that pilots request a frequency change after they depart Class D airspace. My major criticism relates to the introduction. The program leaps into a review of the ICAO alphabet and how to pronounce numbers. A more inviting approach would have noted that for all its strangeness to the novice, radio communication, like the essentials of a foreign language a tourist needs to get along, is, for the most part, restricted to a small set of phrases deployed in a highly structured dialog. The DVD includes an mp3 file of all the audio from the program; you can load it onto an iPod or other device to listen to whenever and wherever you like. The disc also has a PDF with instructions and help; I wish Sporty’s had added a reference sheet with links to the AIM and other resources, such as the free online courses and training materials available from AOPA Air Safety Institute. A great bonus would be a PowerPoint presentation that an instructor could use when discussing the topic. All-in-all, however, VFR Communications is a good example of how today’s technology can make quality interactive training available anytime, anywhere.